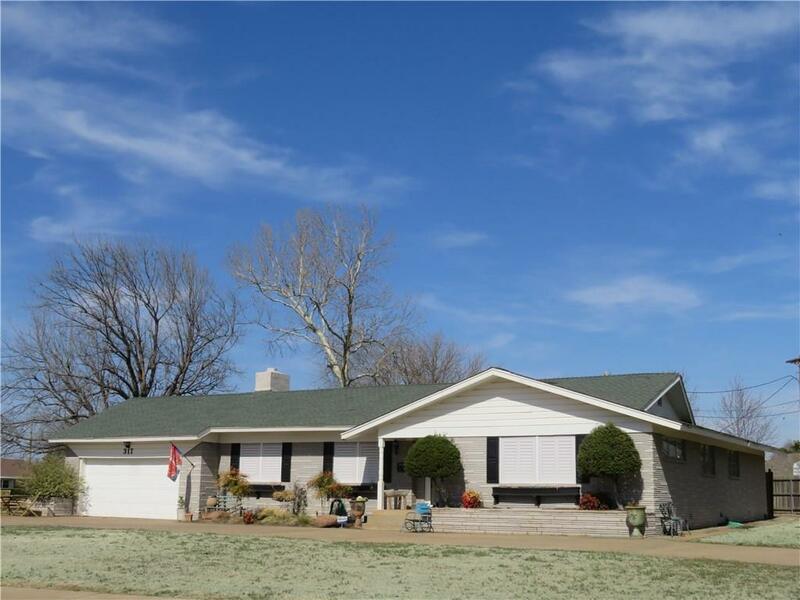 317 S Cardinal Circle, Altus, OK.| MLS# 855040 | CENTURY 21 Altus Prestige Realty, Inc. Cozy, warm home located close to shopping. Circle drive and drive to garage. All flooring, though out, is new porcelain wood grain tile. Recent interior paint. Dining room, formal living room has fireplace, ceiling fan and French doors to the patio. Kitchen has eating bar, high rise faucet, electric counter top burners, built in oven, microwave/vent, dishwasher, high rise faucet, pantry & garbage disposal. Lg. laundry room with cabinets. Laundry has a door to the backyard. Three bedrooms, all with ceiling fans. Large master with two large closets with extra storage & a large built in matching cabinet. Master bath has double vanities. Security system & smoke detector. Two car garage with built in cabinets, an electric opener and a fold down ladder to the attic . Storm cellar just steps away. Underground sprinkler system make watering a snap. Lg. patio & storage building for all your extra items, Wood privacy fence. Landscaped yard. Front has a storm door. Comfortable and move in ready.